Onkyo TX-NR3030 review | What Hi-Fi? The Onkyo TX-NR3030 AV amplifier is a tremendous bit of kit, and the sort of amp that not only rips the flag out of the competition’s turf but takes it home too. At £2500 it’s pricey, but what you get for your money is a super-sounding box of tricks, including the much talked-about Dolby Atmos. For the uninitiated, Dolby Atmos is the next step in surround-sound technology. It brings an element of verticality to your traditional set-up. With added in-ceiling speakers, or up-firing speakers that bounce sound off your ceiling, you’ll find yourself being covered by a dome of sound. The point of this is to create a more natural soundfield. You get a sense of height to the presentation, and sound effects travel around the room more organically than before. That’s the theory, anyway – and on the Onkyo TX-NR3030 it really works. The effect is subtle. Sounds don’t blast you from above, but rather you feel your listening room open up. The soundfield is massive, spacious and utterly immersive. Suddenly you no longer have a ceiling. You may feel mildly concerned when you first hear raindrops fall from above you, but that sense of concern swiftly turns into admiration. Switch between Atmos and standard 5.1 and you’ll realise just how imposing your ceiling really is. Without Dolby Atmos, you’ve been missing out. Of course, it’s not all about the atmosphere. Sometimes you just want to have a bullet zing past your left ear. In this respect, the effects placement with Dolby Atmos is superb. We load up a Blu-ray of Transformers: Age of Extinction (there are very few Atmos discs available as yet) and the sound of drones and helicopters hovering above us brings a smile to our faces. Bullets go through you and hit the other side of the room, rather than sticking to one corner at a time. We’re just as impressed with the Onkyo TX-NR3030 when we take Dolby Atmos out of the equation. With a 5.1 set-up there’s still a huge sense of space. More importantly, the character of the sound ticks all the right boxes. It’s a tonally balanced presentation, with no undue emphasis on any part of the frequency range. High notes are crisp but not harsh. The midrange is direct and full-bodied, while the bass is deep and taut. It’s a smooth, rounded listen that’s very easy on the ears. We’re also impressed with the amount of detail on offer. We watch a Blu-ray of Black Sea, and the submarine’s creaking and clanking has enough texture to make us concerned about our room’s structural integrity. It’s a subtle sound, with plenty of nuance. The Onkyo is not the last word in agility and punch, but the sound is light-footed enough – and strong dynamics help. The rival Pioneer SC-LX88 might yield a more exciting, hard-hitting sound, but it’s also a more tiring listen over time. And the Pioneer doesn’t have quite as much subtlety. The Onkyo may not be as much of an adrenaline rush, but it has no trouble entertaining us. Top marks for sound, then. But elsewhere, this box of tricks deserves praise too. When it comes to features, the Onkyo TX-NR3030 means business. It boasts 11.2 channels of power. That gives you some degree of flexibility when it comes to your Atmos set-up. We used a 5.1.4 system (meaning five surround speakers, one subwoofer, and four Atmos speakers), but the amp allows up to 7.2.4. There’s very little that the Onkyo doesn’t do. Take streaming, for instance. DLNA certification means you can stream music both from networked computers and storage devices. Network connectivity is by ethernet and built-in wifi. Wifi means flexibility, but for a more stable connection we’d still recommend a wired connection. File compatibility is good, and you’ll be able to play MP3, WMA, FLAC, WAV, Ogg Vorbis, AAC, Apple Lossless, LPCM and DSD up to 5.6MHz. There’s also AirPlay, which means you can stream from a number of Apple devices. Don’t have an Apple device? That’s fine, you can use Bluetooth, which is also built-in. And if you don’t want to use your own material, you can find more from the internet. The Onkyo supports Internet Radio, as well as Spotify Connect, Deezer and Aupeo. Now you have the world’s content to discover. When it comes to plugs, the Onkyo is very well endowed. There are eight HDMI inputs, which is more than we find ourselves using at any one time. You get three each of digital optical and coaxial inputs, while a USB port lets you play music from memory sticks and iPods. There are also plenty of analogue inputs and outputs, which can be used for multi-zone listening. Now, a word on setting up the Onkyo. Pay special attention to the way you hook up your speakers, because the terminals can be a bit confusing. There’s no label for Atmos speakers, so you’ll have to connect them to ‘Height 1’ and ‘Height 2’. Automatic calibration is quite accurate, but we’d suggest taking the time to check the settings so that the Onkyo realises Height 1 and Height 2 are your Atmos speakers. If you’re using large speakers, make sure that’s reflected in the menus too. We’d also suggest at least starting with all processing modes off and experimenting with each one in turn. The ‘night mode’ flattens the dynamic range, making the sound a bit unexciting. Turn this off and you’ll hear what the Onkyo can really do. 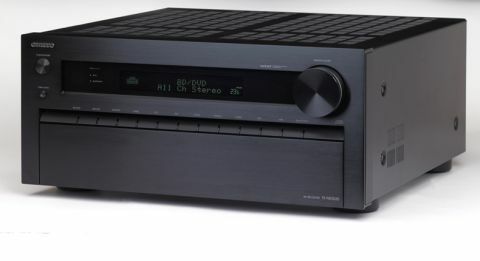 As for design, it’s difficult to get excited about any AV receiver, and the Onkyo is no exception. But it’s not unpleasant to look at. There’s only one dial (for volume), with input selection left to individual buttons along the face. We’d prefer a dedicated input selection dial, but it’s hardly a deal-breaker. The build quality is strong. This is a well-built metal box, available in black or silver, and it’s heavy enough to convince you not to move it once it’s settled. The remote control is pleasant to operate. It’s a good size, with well-spaced buttons, and you don’t need a degree to navigate it. If you don’t like it (or if you lose it) you can always use the remote control app (free on Android and iOS). It’s a bit simple, but it gets the job done. We find ourselves very impressed with the Onkyo TX-NR3030. With a class-leading sound and a great list of features, it offers plenty for your money, and is one heck of a comeback for Onkyo.